9th July - The "froglets" have now lost their tails and appear as fully formed young frogs. They can now use their four limbs to crawl up plant stems in order to leave the water for the very first time. 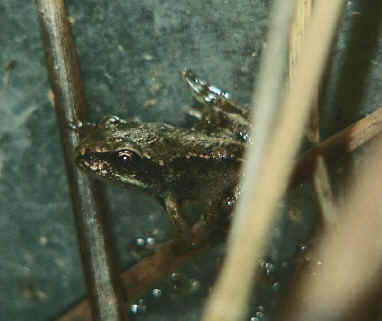 The only noticeable difference from the adults is the size, the young froglets are about 1cm in length, compared to around 8cm for a fully grown adult. It will take three years for the young froglets to reach their full size. Of all the tadpoles that emerged from their gelatinous egg cases back in early March, only a very small proportion of them have actually made it to the stage of leaving the water. Most will have been eaten by other animals or succumbed to disease during the four month period of development in their freshwater habitat.